Use the great MTR resource online to find the quickest way to get to Tung Chung Station. 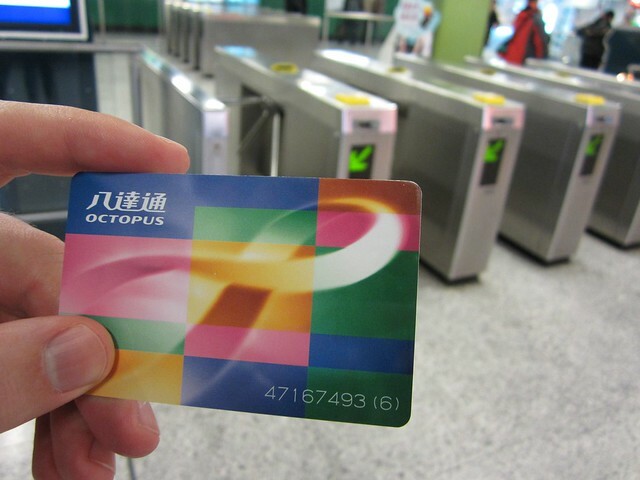 You swipe your octopus card to go through the turnstile and get on the train. For the MTR, you also swipe when you leave the station at your destination and that is when it will deduct money from the card based on the distance you traveled. For us to get from the Prince Edward Station in Mong Kok to the Tung Chung station it cost $14.1 HKD pp/each way. I am from Chicago and am an avid rider of the El since I don’t own a car. The MTR puts the El to shame (sorry Chi-town!) The MTR is spotless, super fast and efficient. It has lights telling you which station you are heading to and even which side to get off at. There is no eating or drinking on any of the public transportation, so there is no trash being left behind. The MTR is a great experience for anyone to get around Hong Kong! 2. You have a VERY limited number of clothes and if you keep going at the same rate you are going to be doing laundry much sooner than anticipated. So, you take some great foggy photos and start your descent back to the village to grab one last cup of fried noodles before you leave. Don’t leave without grabbing a cup of noodles for 15 HKD ($1.90) and while you are at it I challenge you to try something new. You may not know what you are ordering, you might hate the taste of it…but try it! We had seen everyone around us eating fish balls and to me they didn’t look appetizing, but like I said a second ago, I don’t care if you THINK you won’t like it. So we ordered the fish balls and of course we opted for the spicy ones and then added more chili sauce to complete the flavor and went in for a big bite of fish. To our surprise the first bite wasn’t so bad… and the second actually got better! We really enjoyed these – the closest thing I have eaten to compare them to would be a scallop, but less mushy and delicious. 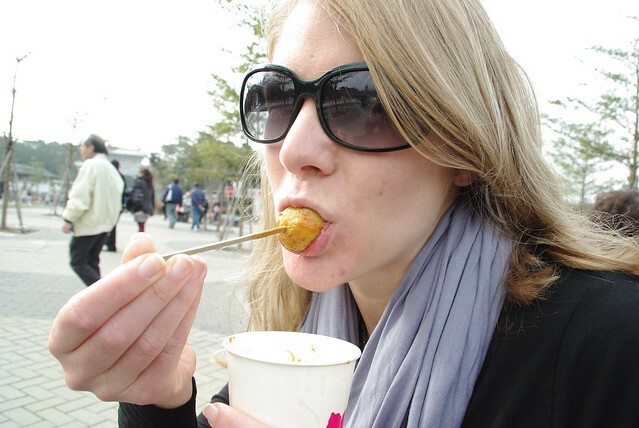 Try something new while you are visiting Big Buddha! It’s been a long day, probably around 4 – 6 hours if you hiked up to Lantau Peak and spent time walking around the monastery. We took the bus back down for an additional $17 HKD and enjoyed once again winding down a narrow road at lightning speed! I would be nervous to do this at night given how close the buses drive to one another. This is a great day trip if you are staying in Hong Kong – get your Octopus card and get going! Send me a message if you have any questions! Did you try the eggs (?) in the crockpot on the right? I’m curious as to what they are. those eggs are called tea eggs. These hard boiled eggs are soaked in some sort of tea, giving the eggs a slight tea fragrance. They are delicious! No they are not. They are common food in countries in Southeast Asia, such as Laos, Cambodia and Vietnam. Those eggs were boiled in water with tes leaves and are supposed to be nourishing. They taste the same as any hard-boiled eggs. Next time you see them, be brave to try one. I mean to get in. Thanks. will kids ages 12 and below enjoy touring the big budha? Yes, I think all ages will enjoy touring the big budha! i’ve never seen balut in hong kong. 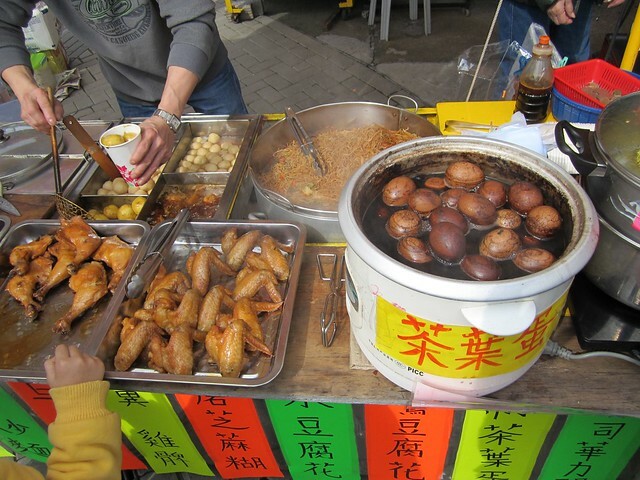 those are tea eggs and are sold by many street vendors. if you can remember the first character on the pot (茶) that means “tea” and is a good guide as to what you’re going to eat. I found your site while we were in Hong Kong and trying to get up to the Big Buddha — so very, very helpful! This is just a note of quick thanks. Also to say that the cable car ride up, while pricey, was completely worth it for us-with-weak-tummies and that the food in the Po Lin Monastery’s cafeteria was some of the best veggie stuff we’ve ever had. I blogged about the experience but from a somewhat different perspective. Just wanted to acknowledge how helpful your notes and comments had been! We accidentally walked back down from the Bug Buddha to the MRT station. I thought I read about a hike down in LP, but once we got started there were no signs, and we got terribly lost at the bottom asking all sorts of people where in the world the station was. Eric still refers to it as the Hong Kong Death March. Taking the bus down like you suggested, probably a better bet! I’m coming into Hong Kong mid April evening, leaving the next day at 3pm. If I start out early enough can I get out to Lantau Island to see the big buddha in plenty of time; looks like the tram doesn’t start until around 9am or so, and I really really hate heights?! Looking at the pictures I don’t know if I’ll be able to get up thast high without freaking! What time does the subways and buses start? Any idea how far from the cruise port? Sorry, but I’m not sure how far it is from the cruise port. 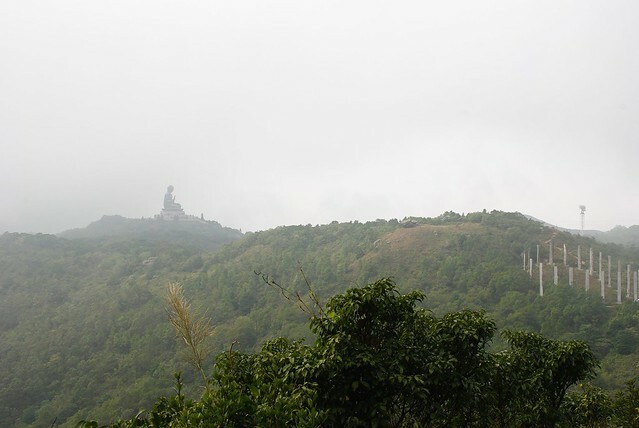 You should have plenty of time if all you want to do is go up and see the Buddha. You just need to figure out how to get to Tung Chung station. If I recall correctly, they start pretty early in the morning, this is on a similar line as the one you’d take to the airport so it gets a lot of traffic. You can probably skip the cable car if you’re afraid of heights, but otherwise being up at the buddha shouldn’t be an issue. I definitely don’t want to buy an Octupus card, you wouldn’t be beneficial to me, since I’m only there for less than 24 hours! Can you tell me the easiest and fastest way to get there, and back by a reasonable timeframe please? If you go in Feb (2nd) can you get back to me, and let me know how it went, as far as how long it took you to get there and coming back?! Thanks for the in depth description. I had planned a day exactly the same for my mother and myself. We took the MTR to Tung Chung station,then bought a one way trip on the gondola for $105. We spent a couple of hours looking around and then caught bus 21 to Tai O terminus for $10.70 approx 20 mins. We went on the boat ride for $25 and didn’t see any dolphines but the ride was fun. We then walked around the village streets, sampled some food and relaxed in the park taking lots of photos. We then caught bus 1 to Mui Wo and caught the ferry to Central Pier 1, $17.50. I can highly recommend this day trip and it is very easy to do on your own. It might be good idea to look up the ferry times, we caught the 5.30pm boat and the next one wasn’t until 7.30pm. I’m planning to travel around Hong Kong on the 3rd of May this year as I have a 15 hour transit time in HK between my connecting flight home. 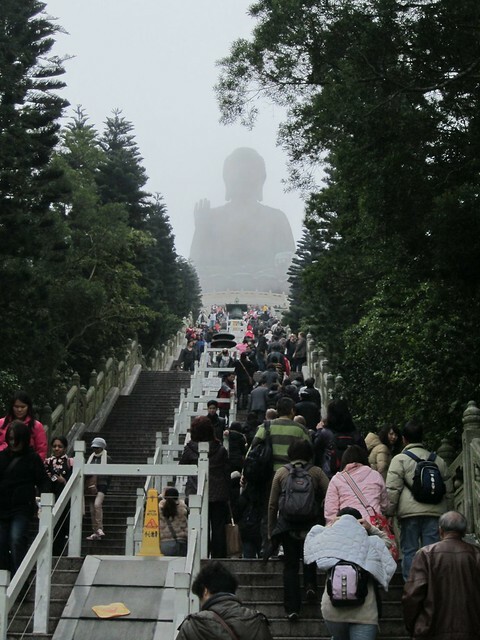 One thing I’m really looking forward to seeing is the Great Buddha statue (minus the hike to the Lantau peak). How long do you think I ought to spare for this? It would help me plan the remaining hours accordingly. Great reassuring piece of your hike to Lantau Peak! I am going to HK next month, and I was skeptical about the journey up as I have read somewhere is it dangerous. But you post really gives me some optimism. Haha.. Are there any safety measures I should look out for on my journey up? Any Tips? I’m planning on coming to Hong Kong in September. Like the different post. 30 mts. It was not bad but you can avoid it by reservation . To walk steps to Buddha was good exercise. Do not miss to see Po Lin monastery and Wisdom Path. I hold to eat at the Ngong Ping Village. Took bus #21 to tai O fishing village . 15mts ride. Bus fare is HK$6.60. Need to have exact change. They do not give you change. Took boat tour for HK$20 to see pink dolphins . Worth tour for the price. The other boat was asking for HK $25. A lots of local food you may try here. You have a choice to take bus to the city from here. It is cheaper than cable. Takes 50 mts. Love your blog. My husband and I are visiting Big Buddha tomorrow and will definitely utilize the tips found here. & Siem Reap), Bangkok and Singapore. We are trying to be thrifty and stay in hostels but still want something clean and safe. We are reading reviews but, so far, still feel like we are coming up a little short. Am I asking for too much? Any recommendations in general or at these specific locations? my mom is in wheelchair, is there a lift or elevator to go up to the big buddha instead of walking the 268 steps up there???? Is there a place where can we leave our things bcoz we are planning to go straight to the big buddha from airport? Omg it was really so helpful. I would just like to know if the bus takes you to the top of the buddah or do you still have to walk up the steps ? You do still have to walk up the stairs to the Big Buddah once you arrive at the site. Hi! Great blog and information. Quick question…if we take the cable car up just to see the Big Buddha and then bus back down, approximately how long do you think it’ll take round trip? I’ve been up to see the Buddha today. One thing I would add is that the no. 23 bus does not go from the bus station nearest to the MTR station. There is a stop indicating no. 23 stops in the bus station but it doesn’t. Carry on walking past the bus stop, go out of the bus station and carry on walking to the right following signs to the gondola ride. There’s a smaller bus station to the right of the gondolas. It’s only 17.20 each way on the bus.